a little bit of sun. We’ll be back online soon. Two posts about football in one day? But, this one really is about football and not just an analogy. These are the top ten goals of the 2009 competing for the FIFA Puskas Award. Once again, I will let you make up your own mind. In professional football (soccer) terms, the 20th Century could be called Real Madrid’s Century. As a matter of fact, FIFA – the world’s football governing body – voted Real Madrid the most successful professional club team of the 20th century. In 2000, Real Madrid kicked off the new century with a reinforced policy of signing the world’s greatest and most expensive players including Luis Figo, Zinedine Zidane, Ronaldo, and David Beckham. 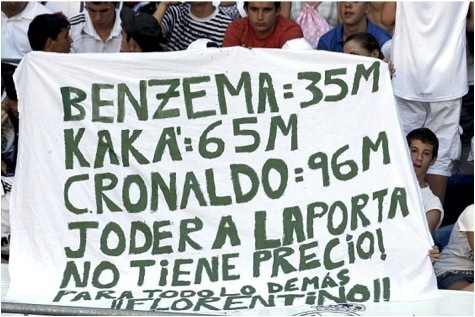 Then in the summer of 2009, Real Madrid again made football history with unheard of spending, including the purchase of Cristiano Ronaldo for the record amount of €96 Million ($135 million), Kaká for €65 Million ($ 95Million and Benzema for €35 Million ($51 Million) (not to mention picking up Xabi Alonso and Alvaro Arbeloa from Liverpool and Raul Albiol from Valencia). Nevertheless, in the Copa del Rey against the modest Alcorcón from Second Division B (Group 2) with an annual budget of less than €1 million, Real Madrid with its budget of over €200 Million ($300 Million) on players alone was eliminated after losing 4-0 in Alcorcón and winning by only 1-0 at its home stadium that seats 80 million spectators. How is it possible that the wealthiest and most expensive professional team in the world cannot defeat a group of part-time amateurs? Should we blame the Real Madrid players? The coaching staff? The club’s governing body? How about the FIFA rules? Or should we demonize Alcorcón? I will let you make the inferences and draw your own conclusions. What Do Spanish Actors Have to Do with the Sahara? Without getting into the merits of the Sahwari people’s claims over the disputed territories in Moroccan controlled Western Sahara, it is hard for me to understand what a group of Spanish actors have to do with any of it. The story goes something like this. Spain had colonies in Northern Morocco between 1912 and 1956, and in Western Sahara from 1884 all the way until 1975. Throughout most of that time period, Morocco (and Mauritania to a less extent) laid claim to that territory. Right before Franco’s death and after the massive Moroccan public demonstrations against Spanish colonization known as the Green March, Spain finally relinquished its control over the area. The land was then divided between Morocco and Mauritania, but after pressure from the Algerian funded and based Polisario (a pro-Sahrawi rebel group), Mauritania abandoned its portion of the land. In 1991, the U.N. created MINURSO to enable a cease fire between the Polisario and Morocco and to allow for an eventual referendum on the sovereignty over the territory. That referendum has yet to occur, and Western Sahara remains fully under Moroccan control, with a majority of its residents now hailing from the rest of Morocco. Flash forward to November 2009. The pro-Sahwari human rights activist, Haidar Aminatu, was traveling to the Western Saharan city, Laayoune, and, according to Morocco, refused to enter with her Moroccan passport and insisted that her nationality be listed as Sahwari. As one can imagine, the Moroccan authorities denied her entry. She was then flown to the Canary Islands, sans papers, where she has refused to leave the airport until she is permitted to take another flight to Laayoune and has been on a hunger strike ever since. The Spanish government is now left in the middle of a game of wills between its neighbor and former colony, Morocco, and the human rights activist that the Spanish left is enamored with. Then today, a group of Spanish actors and labor union politicians – including Pedro Almodóvar, Pilar Bardem, Ruth Gabriel, Juan Diego, Aitana Sánchez Gijón and Juan Diego Botto, – sent an email to Spanish King Juan Carlos requesting his intervention in favor of Haidar Aminatu. For the most part, the Spanish side against the Moroccan government and in favor of Sahwari independence (whereas the U.S. government sides with Morocco). Not only was Western Sahara Spain’s last colony (Ceuta and Melilla not under discussion here), Spanish colonization of Morocco was also uniquely tied to the Franco regime; Franco had been the Commander of the Army of Africa which played a key role in the Spanish Civil War. On the other hand, for the Moroccans the Green March and the independence of the territory from Spain have become important historic assertions of pride, unity and sovereignty in the Moroccan national psyche. It is ironic then that a group of pseudo-intellectual Spanish celebrities are so eager to take sides, regardless of all of the historic connotations of their position. What does Western Sahara have to do with them anyways? Other than being a vestige of Spain’s colonial and Franquista past. These outbursts include everything other than arguments addressed to the only question that matters: are the criticisms that have been voiced about Obama valid? Has he appointed financial officials who have largely served the agenda of the Wall Street and industry interests that funded his campaign? Has he embraced many of the Bush/Cheney executive power and secrecy abuses which Democrats once railed against — from state secrets to indefinite detention to renditions and military commissions? Has he actively sought to protect from accountability and disclosure a whole slew of Bush crimes? Did he secretly a negotiate a deal with the pharmaceutical industry after promising repeatedly that all negotiations over health care would take place out in the open, even on C-SPAN? Are the criticisms of his escalation of the war in Afghanistan valid, and are his arguments in its favor redolent of the ones George Bush made to “surge” in Iraq or Lyndon Johnson made to escalate in Vietnam? Is Bob Herbert right when he condemned Obama’s detention policies as un-American and tyrannical, and warned: “Policies that were wrong under George W. Bush are no less wrong because Barack Obama is in the White House”? aided by the above video that reveals the shockingly scarce criteria behind Palin worship, almost as if to remind us of the inherent perils in the blind no-questions-asked presidential adoration so common during the W. Bush administration. In response to my post on the irrelevance of the Tiger Woods marital crisis story, my brother — a public interest attorney in the Bronx — brings up an excellent point about the disparate treatment of the wealthy and the poor in domestic disputes. For example, I was recently listening to a Leonard Lopate Show podcast about police informants and the example of Jack Abramoff was given. In exchange for his testimony, Abramoff — probably the most corrupt lobbyist in Washington history — got a lighter sentence than would someone found with less than a teaspoon of crack. Yet we continue to believe that the poor in America get all of the breaks. On Thursday night in Vienna, a group of neo-Nazi extremists interrupted the European club match between Austria Vienna and Athletic Bilbao. The match coincided with a pan-European meeting of neo-Nazis from Austria, Bulgaria, Spain, and Italy. This type of incident should be recognized for what it is: terrorism, pure and simple. Yet, it received absolutely no coverage whatsoever in the New York Times, Washington Post, or CNN. Were the neo-Nazis armed, FOX would have called it a Tea Party.